Join me & my dear friend & guide extraordinaire, Didier Binetruy, for a one-of-a-kind yoga journey to the North of India. This is the kind of trip that will give you a taste of what it's like to travel & stay in a few different places, whilst also enjoying daily yoga & meditation practice, meeting new friends, exploring special nature spots & immersing yourself in the amazing culture of India. 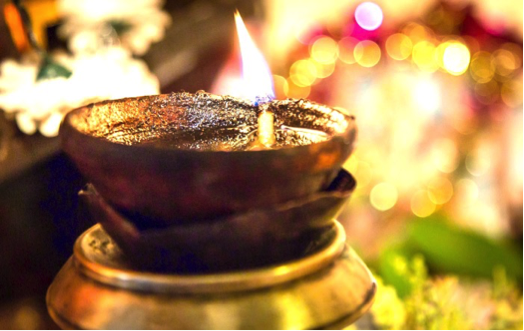 Take time out & discover spiritual India and deepen your Yoga practice in inspiring & comfortable surroundings, and in the company of fellow Yogis! Tips: They are an institution! Never claimed emphatically, they are expected. Note that service is not included in bars and restaurants. I have had the travel bug for as long as I can remember & have been lucky enough to travel to a few places around our beautiful planet but the list keeps on growing! It has been a dream of mine to combine 2 of my passions - yoga & travel - and share them with others, for a really long time & I am so thrilled and excited to finally be able to turn this dream into reality! As a yoga teacher, herbalist & body worker, I am passionate about the connection between body & mind & how they affect each other. I am constantly amazed by the infinite intelligence of the body & its innate capacity for balance & healing. I have been practicing Yoga for the last 25 years and I never tire of the profound effect it can have on people's lives, by allowing & fostering a better connection between body & mind. It is with deep gratitude & commitment that I wish to share the gifts of yoga & living a life of balance. 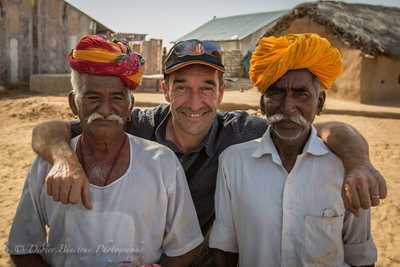 Our guide on this trip is Didier Binetruy – born French, he is known in India mostly with his local name, Devgan. He left France when only 18 to work and travel in Asia, Africa and Australia. He has lived and traveled extensively in India for nearly two decades and considers the country to be his spiritual home. He worked for many years as a trekking guide and tour leader for the well known French trekking agency Terres d’Aventures, and has now been working independently for years. He is a photographer, nature lover and a certified hatha yoga teacher, who practices meditation under the guidance of his spiritual Master, Sri Chandra Swami ji Udasin. Didier spends his free time with his wife in the Himalayas and is always happy to introduce new people to the secrets of India that he loves. Day 1: Arrival to Delhi. Discovery of the sacred and spiritual places in the city, depending on your arrival time. Night at a The Hanz Plaza hotel. Day 2: Morning train to Haridwar, one of the most holy cities of India located by the sacred river Ganges, (06:45/11:22 Hrs). On arrival, transfer to Rishikesh. Stay at the Parmarth Niketan Ashram by the river. 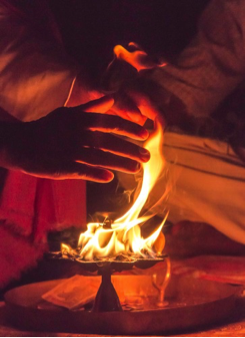 If you are not too tired, you may want to practice Yin yoga in the evening, followed by the daily “Aarti” fire worship ceremony on the bank of the Ganges. 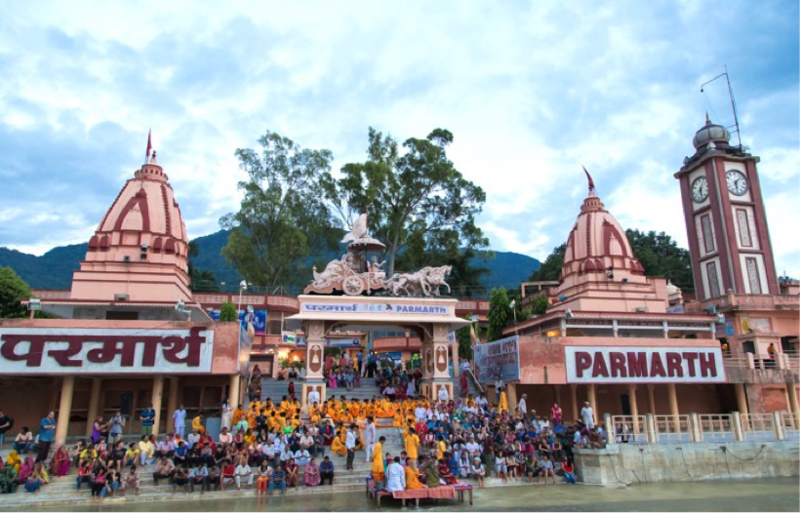 Day 03: Full day in Rishikesh, the «international capital of Yoga». Asana practice in the morning which you may want to experience with one of the Indian Yoga teachers from the ashram. After breakfast, we will explore the village of Ram Jhula and its surroundings. We will take a scenic walk to the nearby village of Laxman Jhula and have lunch there enjoying views of the Ganga. Late afternoon Yin practice. Over night stay at the Ashram. Day 04: Full day in Haridwar. Visit of the town, its ancient colourful markets and famous bathing ghats. 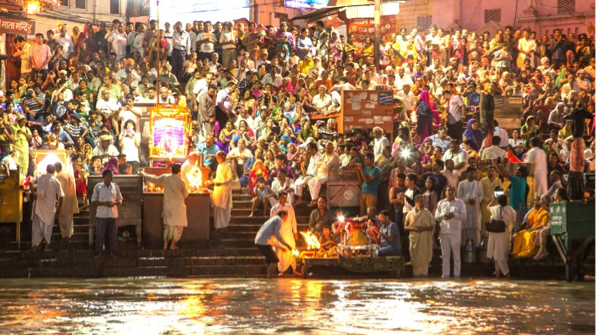 We will participate in the evening ‘Aarti’ fire ceremony by the Ganges, which attracts pilgrims from all over India. Overnight train to Kathgodam, in a comfortable A/ C sleeper coach. Day 05: Arrive Kathgodam at 07:10am & transfer to Kasar Devi, a small mountain village located at the altitude of 2000m, facing the Himalayan snow peaks (3½ to 4 hrs drive). Rest of the morning at leisure. 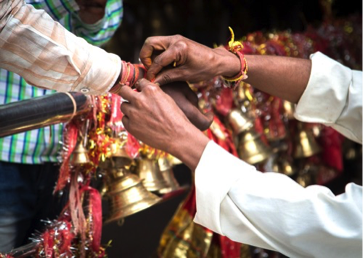 Afternoon visit of the village and famous Kasar Devi temple, an easy afternoon stroll near our hotel. Evening Yin practice. Night at Kasar Rainbow Yoga Retreat. Day 06: In Kasar Devi. Morning practice of Asana & Pranayama, followed by a traditional Indian breakfast. Walk to Chittai temple, an important local temple worshipped by thousands of people in Kumaon. Lunch will be a packed picnic on the way. Walk duration is approx 4hrs, level: easy - of course you have the option of spending the whole afternoon relaxing around the resort instead! Evening Yin Practice. Night at Kasar Rainbow Yoga Retreat. Day 08: In Kasar Devi. Morning practice of Asana & Pranayama followed by breakfast. Resting time in the resort, optional walk to a small waterfall. The walk starts downhill for an hour and half, all the way to the waterfall. We will have a packed lunch with us and enjoy our picnic there. The walk back to the ridge is uphill all the way. Walk duration 3 to 4hrs, moderate difficulty. Gentle Yin practice in the evening, followed by dinner. Night at the Kasar Rainbow Yoga Retreat. Day 09: Kasar Devi to Binsar. 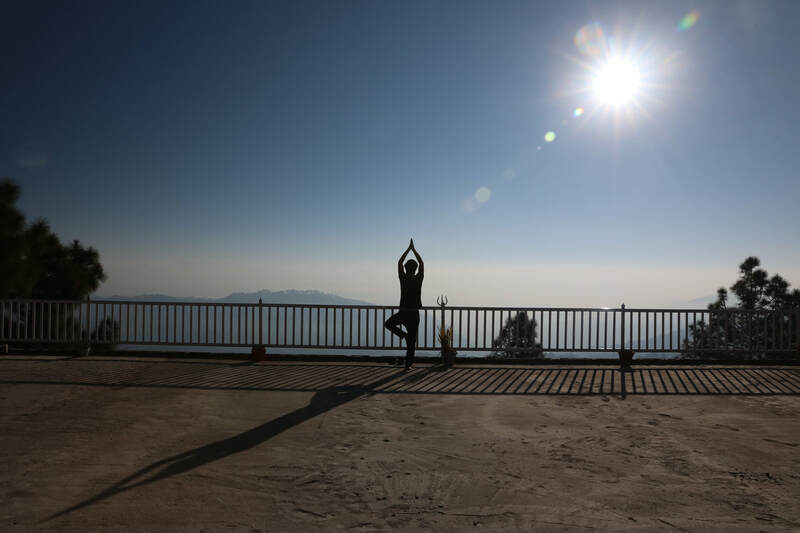 Morning practice of Asana followed by breakfast, and short transfer to Binsar wildlife sanctuary, located at the altitude of 2300m (22 km away from Kasar Devi) where we will spend the next 4 nights. Check-in followed by free time and lunch. Short walk in the wildlife sanctuary with an expert naturalist. Yin practice. 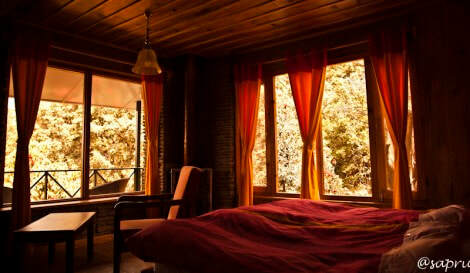 Night in Binsar forest retreat. Day 10: In Binsar. Beginning of a short 3 days silent retreat. 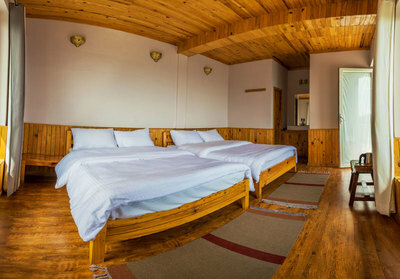 Practice of twice daily Asanas, Pranayama, Meditation as well as silent walks in the ancient oak and rhododendron forest. You will have the opportunity to experience 3 days of complete silence in the lap of nature. It will give you a small taste of what the monks and yogis are experiencing daily in their ashrams or caves. Yoga nidra practice. Night in Binsar forest retreat. Day 11: In Binsar. Second day of the silent retreat. Today will be more or less the same schedule for the practice. Night in Binsar forest retreat. 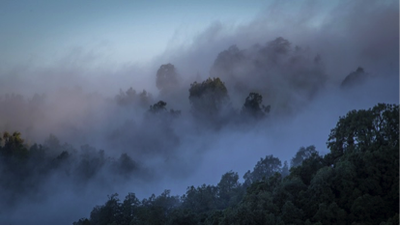 Day 12: In Binsar. Last day of the retreat. Morning Asana practice with Pranayama and meditation. We will break the silence in the afternoon and share our experience with each other. Yin evening practice. 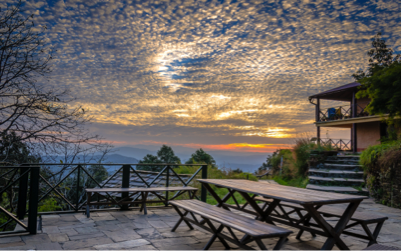 Night in Binsar forest retreat. Day 14: Early morning arrival to Delhi. 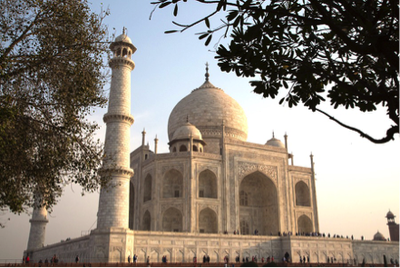 Continue with a drive to Agra (4 hours) where we will visit the legendary Taj Mahal, built at the 17th century by Mughal emperor Shah Jahan as a funeral tomb to his beloved wife, Mumtaz Mahal. We will also visit Agra fort, one of the most beautiful Mughal forts of the whole of India. Night in a hotel in Agra. Day 15: Drive back to Delhi (4 hours). Visit of Old Delhi and the famous Jama Masjid Mosque as well as the small market lanes in the surrounding area. Night in a hotel in Delhi - or late departure back home. Pay in full by 21st January 2019 and get a AU$400 discount! Note: there is only a limited number of private rooms, so book in early to avoid disappointment. AU$450.00 - non-refundable unless cancellation on our part. For payment details, please email me here. Feel free to get in touch if you have any questions & I'll gladly answer them!